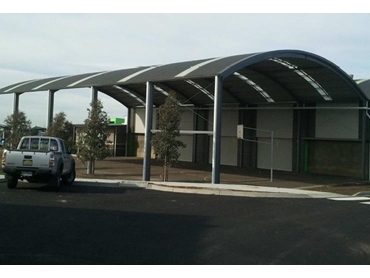 Trusteel Fabrications has completed a new curved roof shelter at a school located to the north of Melbourne. The new curved roof shelter has been built as an extension to an adjacent similar shaped closed room structure to enhance the usability of the space. The new structure has received positive feedback from teachers, students and visitors to the school. Trusteel offers design, drafting, engineering and fabrication services with site construction for a wide range of buildings. The company also provides assistance with planning and building permits.